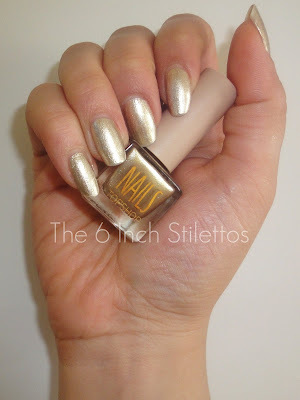 I posted about the new Topshop Makeup Sandstorm collection last week and told of my love for the nail duo in Zealous. Well, I managed to get the gold polish from the duo on my nails and I am happy to report that it is a winner! It's a pale gold shade that looks like you've dipped your nails into liquid gold and I love it. The first coat went on really streaky and had me worried that this was going to be a dead end of a product but after the second and then the third coat, it was fine. I would reccomend that you wait about 5 minutes between coats because if you don't, you'll up dragging the polish and it'll end up a streaky mess. Oh and this product has some serious staying power! I've been wearing this number for about 4 days now and have washed umpteen dishes and all sorts and it hasn't chipped once. Hell, I don't even have any tipwear so I'm kind of amazed by this considering most polish look horrendous after about 3 days. Kudos to you, Topshop Makeup!